Fire up the grill (or grill pan) for a taste of summer all year! 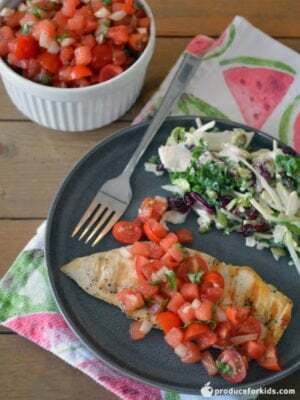 Grilled chicken is topped with a light, refreshing and fruity watermelon salsa that will transport you to an island getaway any time of the year. Serve with a packaged salad kit for a quick dinner. Mix watermelon, tomatoes, onion, basil, 1 tsp. oil, balsamic vinegar and salt in large bowl. Cover and refrigerate. Preheat grill or skillet over medium heat. Brush chicken with oil and season with salt and pepper. 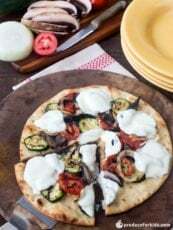 Place on grill or in skillet and cook 3 minutes per side, or until internal temperatures reach 165F. Remove from skillet. 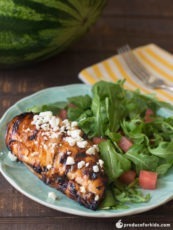 Top chicken with watermelon salsa. 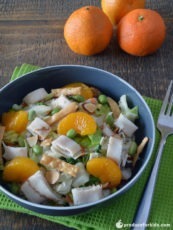 Prepare salad kit and serve with chicken.